Welcome to the Tivoli accessories page. Here you’ll find everything you need that will allow you to enjoy your Tivoli in all the best possible ways. Every Tivoli Radio is ready to play straight out of the box and comes with everything you need – simple instructions, the right power lead, aerials and in some cases the connection leads. You may however, be needing to replace something or wish to expand on what your Tivoli can do, or connect an iPod. Here is a list of Tivoli accessories and useful cables so if you know what you need contact us and we’ll get it straight to you. Otherwise we are happy to advise you. If you would like to return your old Pal radio battery to us we’ll dispose of it responsibly on your behalf. Unfortunately there has been quite a jump in the price of the PAL rechargeable battery packs. This is partly due to exchange rates but is mostly because of international compliance requirements in shipping which came into force early 2015. For more information please see the IATA website and this article which provides explanation. These light weight beautifully made headphones are a pleasure to use. The walnut wood housing not only adds to their visual appeal but has great acoustic properties that contributes to their lovely sound. Officially called 'Radio Silenz' these are active noise cancelling headphones designed for travel. Hence they are sturdily built and fold up for portability. Despite this intention they are all round excellent headphones for anyone, anywhere anytime. Warmly recommended. Send your order with cheque to Totally Wired, 217 Stuart Street, Dunedin 9016. * Please add $5 for the courier bag. 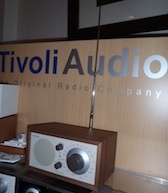 With any of the Tivoli analogue radio models – One, Two, Three and PAL, the tuner can get a little noisy and stiff in operation over the years. This isn’t unusual and often related to most peoples preference for just listening to one or two favourite stations. We’ve become adept in servicing these models and can often make worthwhile improvements to the performance simply by giving the internal working parts a good clean and a little lubrication. We’ve also got improved aerials and an array of spare parts if required. If you’:d like to get your Tivoli serviced and bought back to new (or maybe even better) drop us a line and send it to us – we’ve got a fixed price of just $70 including GST and courier back to you for a standard service. It’s safe and easy to get Tivoli from Totally Wired See 'How To Order'. So why choose to buy Tivoli from Totally Wired? Totally Wired are an independent, locally owned retail store. We therefore have no financial connection with any import agency. So our product range is chosen solely on the basis of each product’s individual qualities. We have a real store and carry stock so you can come in and listen. Failing that we have many years of selling Tivoli and have the expertise to help you choose. We provide courier delivery anywhere in New Zealand. And even gift wrap for free when you choose to buy a Tivoli for a friend. So, even if you are outside of Dunedin, it’s reassuring to deal with people who you know will answer the phone when you call and will be around next year. And we support the World Wide fund for Nature and Save Animals From Exploitation.